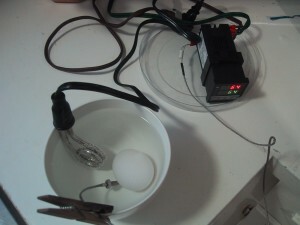 I put together a $25 sous-vide egg cooker with a $20 PID temperature control module I purchased from ebay (which included a thermocouple and free shipping), a $2 immersion heater and a $1 extension cord (both purchased at a thrift store). I added a few crimp on connectors that I already had (but we’ll say you could get a few for $2 at the hardware store) and a free bowl and clothespin that I stole from the kitchen. I’m happy to report that it cooked the egg just fine. The temperature of the water in the bowl would vary by about 5 degrees from the top to the bottom as I did not have any type of pump to circulate the water. I was hoping that convection currents would do something for me, but apparently the water just stratified. It has a few exposed wires laying about, and a bowl of water sitting near them. For permanent use an enclosure will add to the overall cost. It can only cook a single egg at a time. The immersion heater draws 125 watts at 120 volts (around one amp) which can easily be switched by the internal relay in the PID controller (rated up to 3 Amps). But, it won’t work with anything big (like the electric kettle I also purchased at the thrift store) until I add a bigger 10-25 amp relay (solid state or otherwise). If you plan on running a big 8-12 amp load from your PID module, I suggest getting one that has a 12 volt output designed to directly control a solid state relay. I would like to use it as a light weight travel cooker. More for cooking veg, soup, potatoes, while on the road. Could the immersion heater handle water + veg etc…? Do I really need the temperature control (looks heavy…)? The basic imersion heater will work to heat a cup of coffee (probably get it close to boiling….but not all the way up to boiling). So if you want to get it that hot, you don’t need the temperature control, although you’ll want to buy an imersion heater with the highest possible watt rating to cook faster.